Thanks to all members for their continued support of the FAA. This is a rough time of the year due to weather. Keep working on your arts and crafts so that when we have shows, we will have plenty of items to show off. Every once in while we get requests from businesses to see if we have any members who wish to put their work on display in their business. Some are even mentioning that we can put sales prices on the items. The City of Fairborn is currently looking for paintings to hang in some offices. They say we can put prices on them, possibly can sell some. If you are interested in showing your work and or selling it, contact me with an email and I will pass this info along to these businesses. Sounds like a great chance to advertise our association and your works. Hope to see you at our meeting on February 6 at 7:00 pm. The Board will meet at 6:00 pm. Peter is a self-taught watercolor artist who has focused primarily on the landscapes of Ohio, Pennsylvania, Indiana, and Kentucky. Though he began painting in 1999, four young children and a busy career as a landscape designer prevented him from painting seriously until 2009. His work typically does not contain a message or a particular statement about life or politics. Rather, he is content when the viewer lingers in front of a piece, enjoying it. Often, Peter is told by his viewers and collectors that his paintings remind them of something from their past. 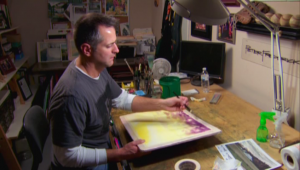 Peter taught a weekly watercolor class at the Rosewood Art Centre in Kettering, Ohio. He also taught watercolor classes and workshops at Studio 14 Gallery in Tipp City, Ohio, and for other private organizations. With a busy family (his children are now 10-16), Peter’s time is at a premium, but he still enjoys teaching when time allows. Peter was featured in an episode of Think TV’s “The Art Show” in 2014. Since 2009, he has shown his work often in juried competitions, invitational exhibitions, and solo exhibitions. Among them are The Ohio Watercolor Society’s traveling show, “Art at The Mill” at historic Bear’s Mill in Greenville, Ohio, and the International Exhibition of Works on Paper in Philadelphia, Pa. He holds signature memberships in The Ohio Watercolor Society, Philadelphia Water Color Society, and Western Ohio Watercolor Society. We will follow recommendations of the media weather reports. When they say travel would be dangerous, we will cancel our scheduled meeting. The Board will communicate with each other by phone and you will be notified by email as soon as a decision is reached. Be sure to check your email before starting out if the weather is bad. If you do not have email access, please call one of the Board members or a member you know who has email access. JoAnne Rumple has turned over her duties as Publicity Chair to James Gifford. James recently joined FAA after attending several meetings with his wife, Connie. James is a skilled photographer and some of his photos were included on our website even before he joined. James will make contact with all available news agencies for FAA events. Thank you for your service, JoAnne. We have several new members who have joined recently. If you see a new face, please welcome and make him/her comfortable. Yuki Hall will be teaching an 8-week watercolor class titled “Watercolor Working with Perspective” starting March 26. The class will meet on Monday mornings from 9:30 to 12:30. In this 8-week course, students will learn fundamental concepts and application of both aerial and linear perspective. Perspective is by far the most important tool to create a sense of 3-dimensional depth in a 2-dimensional picture plane. Used effectively, it allows us to inject a powerful mood and atmosphere in your paintings. However, many students are intimidated about the term “perspective,” thinking it is only understood by artists with some architectural or engineering background. Nothing is farther from the truth. Perspective, discussed and demonstrated in simple, step-by-step fashion with practical examples, can be easily understood and utilized by students of any background and any skill level. A generous amount of class time will be spent on drawing lessons using various perspective tools, as well as other design concepts that are important for creating paintings with strong visual impact. Yuki’s highly organized, friendly, and non-intimidating teaching style has been well received for years by students of all levels. The cost for this 8-week class is $105. To register, please send the payment and the registration form to Yuki Hall, 4136 Fox Fern Ct. Beavercreek, OH 45432. For any questions regarding this class, please call or email Yuki at 937-679-2464, yukihallfineart@gmail.com or www.yukihallfineart.com . A registration form is available in the Gallery or is attached. B-W Greenway has published its flyer for the Landscapes 2018 competition. Copies will be available in our Gallery and are attached. The location this year is Oakes Quarry Park, a City of Fairborn park located near the intersection of Interstate 675 on State Route 235. For those of you who enjoyed the demo Nancy presented at our October 2017 meeting, you will pleased to know that she is offering several workshops during 2018. Two 3-day workshops are available at the Pendelton Art Center, 1310 Pendelton St., Cincinnati, OH 45202, Studio 611A, on March 2, 3, and 4, 2018 and on November 2, 3, and 4, 2018, from 9:30 am to 4:00 pm. A 2-day workshop is available at Bruce Neville, March 9 and 10, 2018, from 9:30 am to 4:00 pm. Please contact Nancy at bnneville@aol.com or call 513-405-0141. The Piqua Arts Council is sponsoring a Tim Saternow Watercolor Workshop, March 27-30, 2018, from 9 am to 4 pm, at the Apple Tree Gallery, 405 N. Main St., Piqua, OH 45356. PAC Members – $300, non-members – $350. Lunch will be provided. For a registration form, call Piqua Arts Council at 937-773-9630, email Jordan@PiquaArtsCouncil.org, or register online at www.piquaartscouncil.org/workshops.html. Thursday Paint-In group meets each Thursday from 9:30 till 12:30 (usually later) for watercolor painting. Connie Gifford and Shirlee Bauer coordinate the group and send out an email each week confirming the meeting. New members are welcome. Because we are using the FAA Gallery, we collect a fee to pay for the use of the Gallery, but all things considered, the fee for each session is well worth it for gathering together with other watercolor artists to share ideas and get inspired. We all have a wonderful time and enjoy watercolor painting together. If you have questions, please contact Connie Gifford or Shirlee Bauer by phone or email. Friday Artists meet at 10 am and paint until 1 or 2 pm each week, with a break at noon for lunch. We meet each week continuously unless there is something else scheduled in the FAA Gallery. Billie Dickson coordinates the group and we don’t paint if only two of us will be there, but anyone can contact Billie to find out if we are on schedule for that week. We expect people who come regularly to be FAA members and pay a fee each week (pays for lights, etc.). It is basically an open work session for artists in any medium and we would love to have others join us. If you have questions, you can contact Billie Dickson by email or phone. Our next meeting will be on Tuesday, March 6, at 7:00 pm. The deadline for submitting articles to be included in the March Newsletter is Monday, February 19, 2018. Please email your articles to albright10@msn.com or call Jackie Albright at 937-233-7532. Please scroll down for additional articles that do not appear in the newsletter.